Take my Michael’s six-year-old hand. As your eyes know sleep. you’re the mommy, I’ll be the son. that you will love me even though. I am so lost in fatherhood. SOURCE: Originally published by San Pedro River Review 2015. 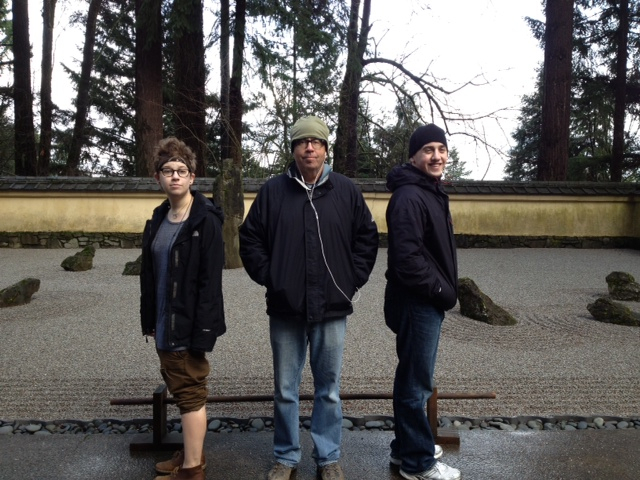 AUTHOR’S NOTE ON THE PHOTOGRAPH: This is a photo of me with my kids (Portland, 2014). I want to be just like them when I grow up. ABOUT THE AUTHOR: Michael Mark is a hospice volunteer and long distance walker. His poetry has appeared or is forthcoming in Diverse Voices Quarterly, Gargoyle Magazine, Gravel Literary Journal, Lost Coast Review, Rattle, Ray’s Road Review, San Pedro River Review, Scapegoat Journal, Spillway, Tar River Poetry, Sugar House Review, and other nice places. His poetry has been nominated for the Pushcart Prize. Proud to have my poem among such fine work in this series. Thank you.